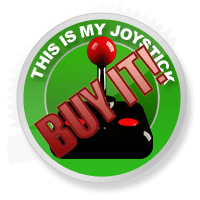 Payday 2 Review - This Is My Joystick! I’ve heard games labelled as ‘anti-social’. I’ve heard people say that playing games causes you to lose friends and not talk to people for hours on end. Let’s get the story bit out-of-the-way nice and quick. To be fair, it’s little more than a premise than it is an actual story. You play as a professional criminal who’s ‘back in the game’. Your boss sets you up with a safe-house and a laptop that connects to Crime.NET. Yes, that’s right, you hook up to a network of criminals and from this you pick jobs to do. Let’s hope the police don’t ever Google the term ‘Crime’, else everyone’s in trouble. That’s pretty much it for story. You’re a criminal. You have a house. You use a laptop to find missions. Done. A few nice touches exist elsewhere to create a sense of setting. For example, your safe-house changes over time to show your increased wealth and also starts to represent what you’ve unlocked. Masks will line the walls and your weapon room will soon start to look a lot busier. It’s a small touch, but it’s appreciated. These neat touches also make their way into the missions themselves. Each job starts with some voice-over giving you a reason for the work you’re about to do. They often boil down to nothing more than ‘Vlad doesn’t like this man, go and rob his jewellery store‘, but it’s better than nothing. 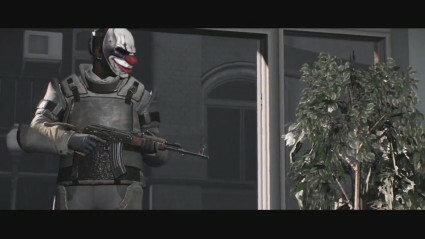 Gameplay is improved from the first Payday in a number of ways. Firstly, the number of different missions available within Payday 2 is huge. Some require you to trash a building, some will want you to make an exchange of bags and others will have you simply stealing everything in sight. While missions will have slightly different objectives, they share many similar phases. You start off by casing the joint. Walking around without a mask on gives you a chance to figure out where the cameras and guards are and, if you’re smart enough, figure out a plan of attack with your team. You’re not allowed to do anything ‘suspicious’ whilst casing, so you can’t do much else than look around. It’s a neat idea though can easily be ruined by forgetting that you’re wearing body-armour. This instantly causes alarm and your original plan of ‘sneaking in and sneaking out’ turns into ‘shoot everything’. It’s kind of frustrating that every single job I’ve played has descended into madness so quickly, making the ability to spec your character with stealth traits a little pointless. Maybe it’s possible to complete missions without raising an alarm, but I’ve not come anywhere close to doing so. When it all hits the fan, you need to do your best to manage the situation. Civilians will start fleeing but you’ll need them for leverage. By aiming at civilians and pressing a button, your character will instruct them to hit the deck. You can now keep an eye on them, as leaving civilians unattended will result in them running away to raise the alarm, or you can tie them up. Keep in mind that you have a limited number of hand-ties and that civilians gunned down result in an increase in police aggression and a financial penalty. Having hostages will help you when you need it most. When your team-mates, or yourself, get ‘downed, a timer begins. After 30 seconds of lying on the floor you’re placed in ‘custody’. To get yourself back in the thick of it, you can give up a hostage. Basically, hostages act as extra lives, so they’re well worth having. Plan to be stealthy. Prepare to shoot. Tactics come back into play when you’re dealing with obstacles that crop up throughout your mission. For example, safes will need to be drilled through and getaway vehicles take their sweet time to turn up. It’s only by working together to ensure that overheating drills are restarted and that all corners are covered that you’ll make it out alive and rich. How you want to play will also affect how you spend your skill points. With each level-up you get skill points that unlock new abilities. Some are geared towards playing stealthily whilst other traits are all about managing hostages, shooting or unlocking doors and safes quicker. These skills are nice in theory, but like I mentioned before, playing anything less than flawlessly will end up in a firefight. My recommendation is to focus on skills revolved around shooting. How the game is able to handle all of this madness is pretty clear. The graphics (I’m playing the 360 version here) are nothing special. Bodies quickly disappear and enemy A.I. isn’t terribly intelligent. It’s safe to say that the game’s presentation is functional. Buildings contain some graphical flourishes, but nothing that’s going to compete with Left 4 Dead’s attention to detail. The most visually outstanding element of the game you have at your disposal is the huge number of masks. These masks are the only real way you can differentiate between each other. It’s just a little annoying that editing your mask takes more luck than anything. You see, the way to unlock new items that personalise the way you play is via cards rewarded after each successful job. Pick a card, it turns over and now you have unlocked that mask colors, mask pattern, weapon and so on. 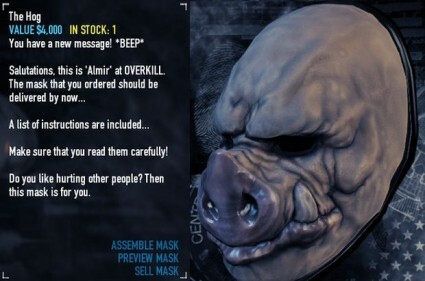 I’m yet to unlock this pig mask. So gutted. Except, you haven’t unlocked it fully. After finding the item on your card you still have to pay for said item. This means that if you want a particular load-out, you’re going to have to play a whole lot of Payday 2 and cross your fingers whilst you’re at it. Another great touch is the way the game is synced to audio cues. When the police are about to make a large-scale assault on your team, the music fades out only to come back in louder and ‘stronger’ than before. It all adds to the sense of excitement and anarchy that surrounds you. The music in general is worth paying attention to. The game has an absolutely thumping soundtrack that’s used to great effect. The voice-over work is less stellar. Some of the delivery of lines is just plain strange. I’m not sure if there’s an accent that I can’t put my finger on or what it is, but some of the lines sound bizarre. Another slight issue is that the four characters will repeat their lines quite a few times as they scream at hostages. So far I’ve talked about the game as if you’re playing it with three other humans. I want to go on record as saying that playing Payday 2 with other people is the only way to play it. You know, if you want to enjoy your time that is. Playing offline with A.I. team-mates is simply not a viable option. Your A.I. compadres will look at you like you’re mad if you wait for them to pick up a bag. They won’t cover your back and they’ll often run straight into a hail of bullets for no real reason. This kind of outfit will get you noticed quickly. Simply put, there’s no other way to play this game. Do not play this game offline. Do not rely on the computer to make for a useful partner. 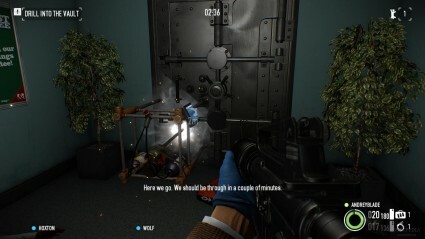 In the end, Payday 2 is a great co-op experience. While it’s a little annoying and disappointing that all missions (for me) turned into a shoot-out, the game constantly rewards you with steady progression. Levelling up unlocks skills and completing jobs unlocks items to purchase. It’s this constant drip-feeding of new content to enjoy with that keeps you playing.